Google has released its monthly Google Play distribution data and Android users will finally be able to bid adieu to Android 2.2 Froyo. The data shows, among other things, that Froyo has dropped to below the 0.1 percent mark, marking the end of what was the oldest active Android version until last month. The date was collected from Android devices visiting Google Play in the seven-day period ending January 9. Froyo in December’s data held on for dear life with the version running on 0.1 percent of Android devices. It has now slipped to below that figure, and dropped from Google’s Android distribution data – the company only lists Android versions with 0.1 percent or greater shares. Notably, the data also represents device running the latest Google Play app – which is only compatible with Android 2.2 and higher versions. The latest data now pushes Android Gingerbread to the top (in terms of oldest iteration) with 1 percent. Meanwhile, Google’s latest version, Android Nougat, is ever so slowly increasing. Last month, Android 7.0 Nougat was listed as running on 0.4 percent active Android devices. 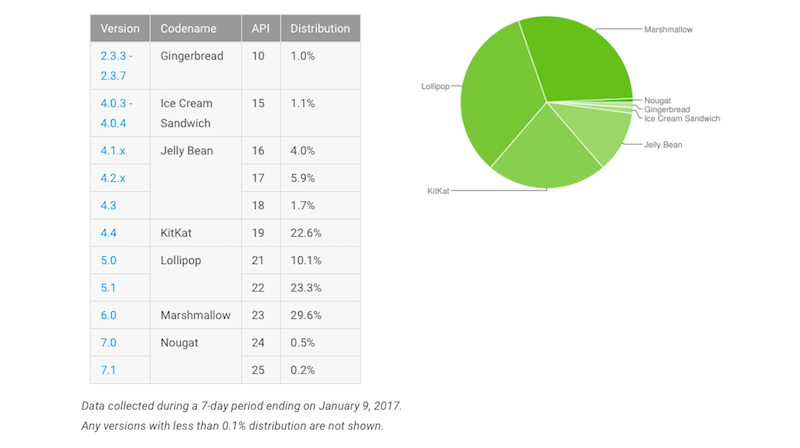 Google has now split Android 7.0 and 7.1 up in the January data, both combined make up 0.7 percent of active devices. The past month saw a bunch of smartphones receiving the Android Nougat update. HTC early last month pushed out the Nougat update for its One M9 smartphone. Sony started rolling out the Nougat update for its Xperia X and Xperia X Compact smartphones. OnePlus kept its promise to roll out the the latest Android version for its OnePlus 3 and OnePlus 3T by the end of 2016. In the latest data, Google reported that Marshmallow has a total share of 29.6 percent of Android devices compared to the 26.3 percent reported in December – an increase in 3.3 percent. Based on the latest data, Marshmallow continues to be the most used version. Meanwhile, Android 5.0 and 5.1 Lollipop combined have a total share of 33.4 percent of active Android devices, which is lower compared to last month when it was at 34 percent. The data further shows that Android KitKat now runs on 22.6 percent of devices compared to 24 percent last month – a decrease of 1.4 percent. Android Jelly Bean sees a combined share of 11.6 percent while Android Ice Cream Sandwich shows a share of 1.1 percent, dropping from 12.8 percent and 1.2 percent respectively. Both the Nougat versions are expected to rise further in the next few months with most flagship smartphones in 2017 expected to run on the latest Android OS. Some 2016 flagship are also due to receive the update, most notable among them being Samsung’s Galaxy S7 and S7 Edge smartphones, which the company revealed will begin receiving Android 7.1.1 version this month. The latest OpenGL version distribution numbers saw OpenGL 2.0 at 40.9 percent, OpenGL version 3.0 at 42.2 percent and OpenGL version 3.1 at 16.9 percent.